Everyday this week I will be choosing an ape to write about to create interest and raise awareness of their plight. 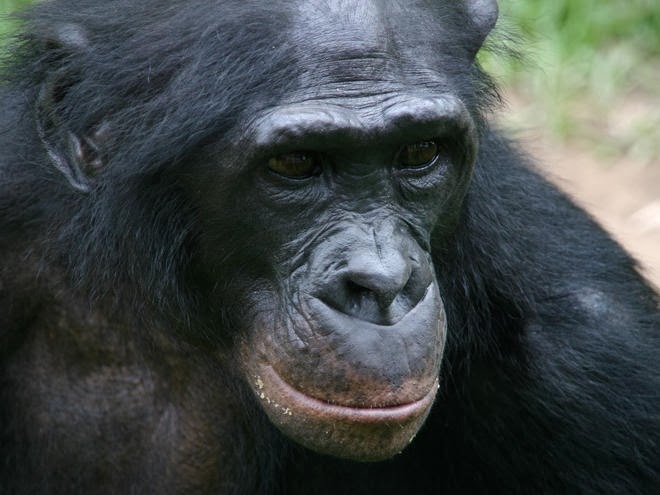 Probably the least well known of the four great apes and you could be forgiven for thinking that the Bonobo was a chimpanzee; sometimes referred to as a pygmy or dwarf chimpanzee. They are remarkably similar, for example also sharing 98.7% of our DNA; but they are also very different. 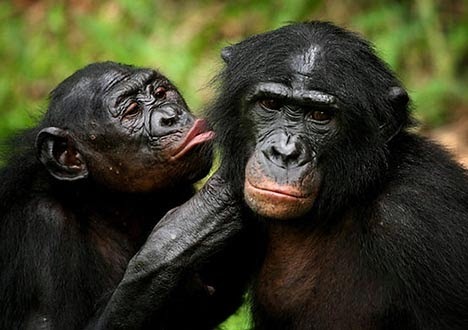 The Bonobo is smaller than a chimpanzee and has pink lips, a black face and a longer head of hair with a neat parting in the middle. Also, the first two toes have webbing and their voices are high pitched, where as chimpanzees have a much lower pitched voice. 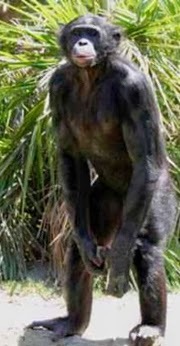 I think one of the most interesting things about Bonobos is their natural ability to walk upright. 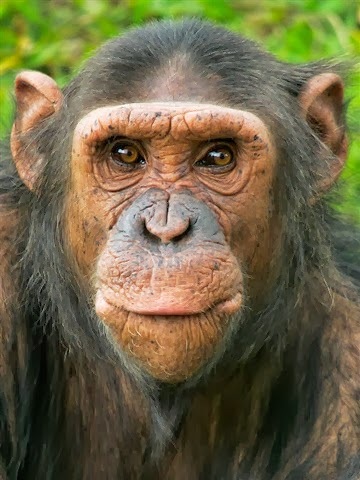 They do it more often then any other great ape and it is said that their anatomy is very similar to Australopithecus, one of our evolutionary ancestors. Classed as "Endangered" on the IUCN Red List of species, Bonobos face many threats to their future survival like deforestation and poaching. Depending on what website you read their numbers range from 10,000 to 50,000, but they all agree that this number is decreasing. In 2003 the DRC came out of a decade long war claiming over 4 million lives. This put tremendous pressure on natural resources and decimated the Bonobos natural habitat. Logging is still an issue and the common agriculture practice of slash and burn farming is quickly consuming their home. Bonobos are hunted for their meat, parts are used in witchcraft and the babies get sold into the pet trade.